I made this fish gumbo from the pot liquor left over from making collard greens. There's usually a couple quarts of that, I put that away in a couple mason jars and use it as the stock for this soup. Bring the rice with two cups of water to a boil in a small saucepan over high heat, then lower heat to medium low and simmer covered for 25 minutes. Take it off the heat and leave it covered. Okay so, the instructions I was working from said to cook the flour and oil, whisking constantly, for forty-five minutes, and I briefly had a flash of what that uber-patient Poppy's life must look like. But you know, only a brief flash. As it was, I was keeping an eye on my roux while I was finely chopping my onion and pepper and celery, whisking occasionally, and boy it went from blonde to mahogany in the blink of an eye at about ten or fifteen minutes. Use your judgment, and constant vigilance! So then I just added my finely chopped vegetables to the roux and let them cook down a bit, and then I added the pot liquor. Then the instructions said to let that simmer for another forty-five minutes, but I bargained them down to 25 minutes. I busied myself in that twenty-five minutes picking the meat off the bone that I also saved from the collard greens, finely chopping that, and also cutting the fish into bite-size pieces. I think I could have also taken the time to shell the shrimp, because I didn't realize until I bit into one that it still had its legs on. Eee. Last but not least, I minced my green onions and parsley. Somewhere in here you also want to taste and salt the soup. Ding, the timer goes off and I add the fish and let that poach for three minutes. Then the shrimp, that poaches for another three minutes. Then the ham bits, parsley, and green onions get stirred in. 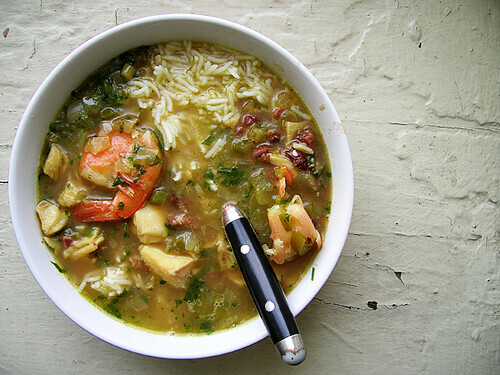 Put a big scoop of rice in the middle of a bowl, and ladle some gumbo over.